The autoantigenic polymyositis/scleroderma (PM/Scl) complex was recently shown to be the human homologue of the yeast exosome, which is an RNA-processing complex. Our aim was to assess whether, in addition to targeting the known autoantigens PM/Scl-100 and PM/Scl-75, autoantibodies also target recently identified components of the PM/Scl complex. The prevalence of autoantibodies directed to six novel human exosome components (hRrp4p, hRrp40p, hRrp41p, hRrp42p, hRrp46p, hCsl4p) was determined in sera from patients with idiopathic inflammatory myopathy (n = 48), scleroderma (n = 11), or the PM/Scl overlap syndrome (n = 10). The sera were analyzed by enzyme-linked immunosorbent assays and western blotting using the affinity-purified recombinant proteins. Our results show that each human exosome component is recognized by autoantibodies. The hRrp4p and hRrp42p components were most frequently targeted. The presence of autoantibodies directed to the novel components of the human exosome was correlated with the presence of the anti-PM/Scl-100 autoantibody in the sera of patients with idiopathic inflammatory myopathy (IIM), as was previously found for the anti-PM/Scl-75 autoantibody. Other clear associations between autoantibody activities were not found. These results further support the conception that the autoimmune response may initially be directed to PM/Scl-100, whereas intermolecular epitope spreading may have caused the autoantibody response directed to the associated components. Anti polymyositis/scleroderma (PM/Scl) autoantibodies are often detected in sera of patients with idiopathic inflammatory myopathies (IIM), scleroderma, and the PM/Scl overlap syndrome, although some anti-PM/Scl-positive patients may not have either of these syndromes [1,2,3,4]. The antigenic complex recognized by the PM/Scl autoantibodies has been reported to consist of 11 to 16 proteins, with molecular weights ranging from 20 to 110 kDa found in SDS–PAGE [5,6]. Most anti-PM/Scl-positive sera are reactive with a 100–110 kDa protein, while some also recognize a 75–80 kDa protein [5,6,7]. Complementary DNA cloning of both autoantigens revealed that the major one is a polypeptide of 100 kDa (referred to as PM/Scl-100) [8,9] and that the 75–80 kDa one (referred to as PM/Scl-75) is a 39 kDa acidic polypeptide that migrates aberrantly in SDS–PAGE . Recently, it was discovered that the PM/Scl-100 and -75 autoantigens are related to the Escherichia coli exoribonu cleases D and PH, respectively . The nucleolar localization of the PM/Scl complex suggested a role in ribosome synthesis , and, indeed, it was found that the yeast homologue of PM/Scl-100, Rrp6p, is involved in the maturation of 5.8S ribosomal RNA . Moreover, a yeast complex, named the exosome, consisting of 11 3' → 5' exoribonucleases, including Rrp45p (the yeast homologue of PM/Scl-75) and Rrp6p, has been characterized [14,15,16]. In yeast, the exosome was shown to degrade or process RNA species in the nucleus as well as in the cytoplasm [15,17,18,19,20]. In human cells, a complex similar in size to the yeast exosome has been shown to contain both the PM/Scl autoantigens and the human homologue of the yeast exosome component Rrp4p . This finding indicates that the human PM/Scl complex is related to the yeast exosome, and it is therefore referred to as the human exosome (reviewed in ). Recently, cDNAs encoding three novel components of the human exosome (hRrp40p, hRrp41p, and hRrp46p) were isolated and were shown to be associated with the PM/Scl-100 autoantigen and hRrp4p . Furthermore, cDNAs encoding four additional human proteins with homology to yeast exosome components have been isolated, although conclusive evidence for their physical association with the PM/Scl complex is still lacking [4,23,24,25]. Our aim in this study was to assess whether autoantibodies target other components of the human exosome than the PM/Scl-100 and PM/Scl-75 autoantigens. 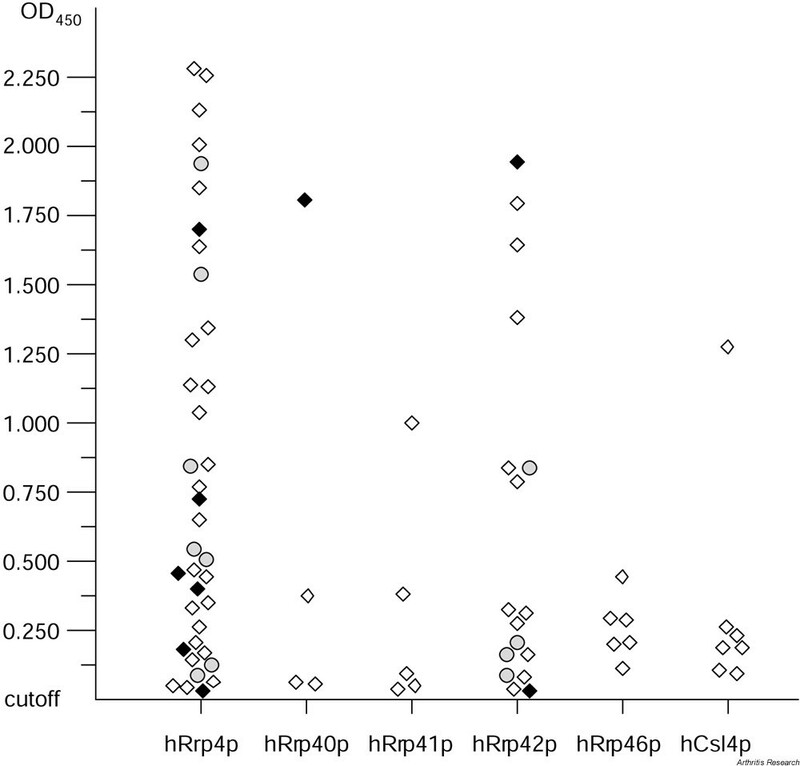 The prevalence of autoantibodies directed to six novel components of the human exosome (hRrp4p, hRrp40p, hRrp41p, hRrp42p, hRrp46p, hCsl4p) was determined in sera from anti-PM/Scl-positive patients with idiopathic inflammatory myopathy (IIM, n = 48), scleroderma (n = 11), or the myositis/scleroderma overlap syndrome (n = 10). The patients with IIM were diagnosed according to previously published criteria [26,27] and most of these sera were included in a previous cohort study assessing the prevalence of several autoantibody types, including those directed to PM/Scl-100 and PM/Scl-75, in a large group of European patients with myositis . Patients with sclerodactyly or systemic sclerosis according to previously published criteria  were diagnosed as having scleroderma myositis/scleroderma overlap syndrome if they also fulfilled the myositis criteria for polymyositis (n = 4) or dermatomyositis (n = 6). The recombinant proteins were produced in E. coli BL21 (DE3) pLysS as His-tagged (hRrp4p, hRrp40p, hRrp41p, hRrp46p) or gluthatione-S-transferase (GST)-tagged (hCsl4p and hRrp42p) fusion proteins. The expression constructs of hRrp4p, hRrp42p, and hCsl4p were generously provided by Dr D Tollervey. The hRrp40p, hRrp41p, and hRrp46p expression constructs as well as the expression and affinity purification procedures have been described previously . Per well, approximately 25 ng of each of the purified antigens (hRrp4p, hRrp40p, hRrp41p, hRrp42p, hRrp46p, and hCsl4p) diluted in 100 μl buffer A (35 mM NaHCO3, 15 mM Na2CO3, pH 9.6) was coated to 96-well polystyrene microtiter Greiner plates overnight at 4°C. ELISA plates were washed three times with 200 μl of buffer B (PBS/0.05% (v/v) Tween-20) before nonspecific sites were blocked with 150 μl of 0.1% bovine serum albumin in buffer A for 2 hours at room temperature. Plates were washed and to each well was added 50 μl of the serum samples, which were diluted 1:200 in buffer C (0.3% (w/v) BSA, 150 mM NaCl, 10 mM Tris–HCl pH7.6, 1% (v/v) Triton X-100, 0.5% (w/v) sodium deoxycholate, 0.1% (w/v) sodium dodecyl sulfate). The plates were incubated for 1 hour at room temperature. They were then washed five times and 50 μl rabbit anti human peroxidase-conjugated antibody (anti-IgG, IgA, IgM, kappa, lambda (P-212; DAKO, Glostrup, Denmark) diluted 1:1000 in buffer C was added and incubated for 1 hour at room temperature. After five rounds of washing, bound antibodies were visualized with 100 μl 3,3',5,5'-tetramethylbenzidine (TMB; Sigma, Zwijdrecht, The Netherlands) using standard methods. The enzyme reaction was stopped after 10 min at room temperature by adding 100 μl of 2-M H2SO4 and the absorbance was measured at 450 nm. All sera were tested at least in duplicate in parallel with positive and negative controls on each ELISA plate. The cutoff value was defined as three times the mean absorbance obtained from a pool of 10 normal human sera, which was run on each ELISA plate. The presence of autoantibodies directed to hRrp4p, hRrp40p, hRrp41p, hRrp42p, hRrp46p, and hCsl4p was determined by ELISA using purified recombinant proteins, which were produced in E. coli either as His-tagged or as GST-tagged fusion proteins. Table 1 summarizes the ELISA data on the anti exosome reactivity of the selected groups of patient sera. In total, 63% (n = 30) of the IIM sera, 73% (n = 8) of the scleroderma sera, and 60% (n = 6) of the myositis/scleroderma overlap sera contained autoantibodies directed to one or more of the novel components of the human exosome. Our results further show that each exosome component is recognized by autoantibodies, although some are preferentially targeted. The hRrp4p component is most frequently recognized by the anti-PM/Scl-positive IIM sera (25/48; 52%), the scleroderma sera (7/11; 64%), and myositis/scleroderma overlap sera (6/10; 60%). Also the hRrp42p component is frequently recognized, albeit less often than hRrp4p (20–36%). Fig. 1 shows the ELISA readings of the anti exosome-positive sera after correction for background signals. Anti exosome ELISA data obtained with sera from anti-PM/Scl-positive patients. Sera from patients with IIM, scleroderma, and myositis/scleroderma overlap were analyzed by ELISA for reactivity with six novel components of the human exosome (hRrp4p, hRrp40p, hRrp41p, hRrp42p, hRrp46p, and hCsl4p). A pool of 10 normal human sera was run on each ELISA plate to determine the absorbance cutoff value, which was set at three times the absorbance of this negative control. The figure shows all positive ELISA signals corrected for background by subtracting the cutoff value for each individual ELISA plate. The corrected ELISA signals of anti-PM/Scl-positive IIM sera (open squares), scleroderma sera (circles) and myositis/scleroderma overlap syndrome sera (filled squares) are indicated. OD450 = optical density at λ450 nm. aAnti-PM/Scl-100 and anti-PM/Scl-75 reactivity of IIM sera was previously analyzed . bNovel human exosome components analyzed in this study. IIM = idiopathic inflammatory myopathies; PM/Scl = polymyositis/scleroderma. Sera that were positive in ELISA were also tested for reactivity with the recombinant exosome components by western blotting. The results indicated that some novel components are poor autoantigens on western blot. Using this approach, we could confirm the reactivity of 75% (3/4) of anti-hRrp40p-positive sera, 71% (12/17) of anti-hRrp42p-positive sera, and 29% (11/38) of anti-hRrp4p-positive sera. However, some sera that were strongly positive on ELISA did not react with the same antigen on immunoblots, while other sera that were only weakly positive on ELISA reacted well on immunoblots. These results suggest that both linear and nonlinear epitopes are important for recognition. The previously reported dominance of the anti-PM/Scl-100 autoantibody activity in anti-PM/Scl-positive sera was also apparent in the sera analyzed in this study. None of the scleroderma or myositis/scleroderma overlap sera and only three IIM sera contained anti-PM/Scl-75 autoantibodies without detectable anti-PM/Scl-100 reactivity. To determine whether the autoantibody response directed to any of the six novel exosome components is correlated with an anti-PM/Scl-100 response, we also analyzed a large group of anti-PM/Scl-100-negative IIM sera (n = 168) by ELISA (data not shown). These results indicated that some, predominantly weak, reactivities may be present in anti-PM/Scl-negative sera: 5% (8/168) of the sera contained detectable reactivity with one or more novel exosome components. In contrast, as mentioned above, 63% of anti-PM/Scl-positive IIM sera contained such reactivity. We also tried to discover other correlations between anti exosome autoantibodies. Although the number of anti-hRrp4p-positive sera is comparable to the number of anti-PM/Scl-75-positive sera, the presence of the two types of autoantibody does not appear to be correlated. Furthermore, most of the sera analyzed in this study recognized only one (25/44 positive sera) or two (12/44 positive sera) of the novel exosome components (Table 2). As might be expected, the single reactivity was predominantly directed to hRrp4p (20/25 sera) and the most frequently encountered combination was anti-hRrp4p with anti-hRrp42p reactivity (8/12 sera). Few sera (n = 7) contained reactivity with more than two novel components of the exosome. aFor these calculations, only the novel exosome components (hRrp4p, hRrp40p, hRrp41p, hRrp42p, hRrp46p, and hCsl4p) were taken into account. bTotal number of sera reactive with at least one of the novel components analyzed. In this study we examined the prevalence of autoantibodies directed to six novel components of the human exosome in sera of patients diagnosed with IIM, scleroderma, or PM/Scl overlap syndrome. Compared with other published series of patients with anti-PM/Scl autoantibodies [2,3], in our cohort, fewer patients with scleroderma or PM/Scl overlap than with IIM were available. This does not impair the conclusions drawn from our data, because the autoantibody subspecificities detected were very similar for the three groups of patients. Our results show that the anti-human-exosome autoantibody response is not restricted to the previously identified autoantigenic components PM/Scl-100 and PM/Scl-75. Indeed, all the novel exosome components analyzed were targeted by some autoantibodies, albeit with relatively low frequencies in some cases. These autoantibodies are associated predominantly with the anti-PM/Scl-100 response, as has been found for anti-PM/Scl-75 autoantibodies [5,6,7]. This correlation may be particularly interesting in the cases of hRrp42p and hCsl4p, whose association with the human exosome complex has not yet been unequivocally established [14,23]. Our results support the idea that the initial autoimmune response may be directed to the PM/Scl-100 protein and that subsequent intermolecular epitope spreading may play a role in the generation of autoantibodies directed to other components of the exosome components. A similar mechanism has been suggested to generate anti-tRNAHis autoantibodies in anti-Jo-1-positive IIM patients or anti-U1A, anti-U1C, anti-U1-70K, or anti-Sm autoantibodies in anti-U1 small nuclear RNP-positive SLE patients [30,31]. The event that initiates the autoantibody response is unknown, but we can speculate that modification of the PM/Scl-100 autoantigen occurring in dying cells, for example by granzyme-B-induced cleavage, could generate neo-epitopes that trigger the aberrant immune response in genetically susceptible individuals [32,33]. On the other hand, there is also a possibility that the intact exosome complex is exposed to the immune system, triggering a selective immune response to some of the components. The immunogenicity of the exosome components may be different for each patient and may be defined by phenomena yet unknown. In that case, the autoantibodies directed to different components might be evoked simultaneously. Since none of the patients studied has been followed up over a long period, it is not possible to predict which of the described scenarios (epitope spreading versus simultaneous immunization) may actually be occurring. The PM/Scl complex, or human exosome, is targeted by autoantibodies that are directed not only to the known autoantigens PM/Scl-100 and PM/Scl-75 but also to recently identified exosome components, most frequently hRrp4p and hRrp42p. However, the anti-PM/Scl-100 reactivity remains the most important one in these sera, supporting the idea that the autoimmune response may initially be directed to this protein. We thank Dr D Tollervey, Dr C Allmang, and Dr P Mitchell (University of Edinburgh, UK) for providing the hCsl4p, hRrp4p, and hRrp42p expression constructs. This study was supported by the 'Prinses Beatrix Fonds' (grant 93–1112) and by the Netherlands Foundation for Chemical Research, with financial aid from the Netherlands Organization for Scientific Research (NWO-CW) and the Netherlands Technology Foundation (grant 349–3699).